Loredana Boboc, an only child, was born on May 12, 1984. She began gymnastics at age 7 at a local club in her hometown of Bucharest, called Steaua. Her parents encouraged her to keep doing gymnastics because she was very talented. She joined her club's junior team and began competing nationally in 1997. That year she was selected to be on the junior national team and made the move to Onesti, the site of the junior training center. Unfortunately, Loredana didn't get to compete in 1998 because of an injury. The decision was made in February of 1999 to move the junior team to Deva, so they could train with the seniors, and Loredana and 10 of her teammates moved to the national training center. There she was coached by Adrian and Elena Boboc (no relation to Loredana). 1999 was really Loredana's coming out year. She competed with her teammates from Steaua at the Como Cup and the Friendly Cup, and was selected to represent Romania at the Jr. ITC and European Youth Olympic Days. Loredana also competed in senior nationals that year and placed first with her team and 3rd on the bars. 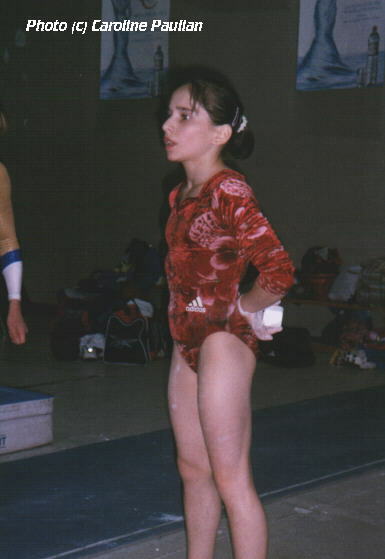 When Claudia Presacan, a team veteran and former Steaua gymnast retired suddenly before the 1999 World Championships, Loredana was selected to replace her. She competed on floor and vault and helped Romania win their 4th consecutive team title. Loredana says that is her proudest achievement so far. 2000 was a great year for Loredana also. She placed 8th in the all around at the Romanian International, although her performance was counted as exhibition-only. And when Maria Olaru had to withdraw from the European Championships in France, Loredana got a spot on the team and helped them to a third-place finish. At nationals Loredana got sixth place and finished second on beam. She also convinced her coach, Octavian Belu, that she deserved a spot on the 2000 Olympic team. In Sydney, Loredana competed on all four events for Romania, and finished an encouraging 17th all around in the preliminaries. She didn't go on to the all around, because her teammates Amanar, Raducan, and Olaru all qualified higher than her. On the night of the team final, Loredana competed four solid routines and helped her team win the gold medal. After returning to Romania, Loredana received prize money, a new Ford Ka (a car), and a small plot of land. Later in 2000, she was honored to be voted as the 2nd place finisher in Steaua's athlete of the year. In early 2001, Loredana participated in the Romania's Stars Tour, along with her Olympic Teammates. In March, Loredana suddenly left Deva. It was reported that personal issues, and issues with the coaches were her reasons. After returning home to Bucharest, Loredana decided to give up gymnastics. Fortunately, Octavian Belu managed to convince Loredana to return to Deva after a week or so and she resumed training. During the next few months, Loredana placed well in her competitions and proved to Octavian Belu that she was a valuable team member. She was selected for the 2001 Worlds team, where she would compete on all four events. Unfortunately, an ankle injury kept that from happening. Loredana did compete during prelims, but was unable to participate in the team final. Loredana returned home to Bucharest in early 2002 with her right ankle still injured. She was recently a spectator at the 2002 Romanian International. As of the summer of 2002, Lori has officially retired from competitive gymnastics and is now teaching fitness classes in Bucharest.